Companies that score Very Good to Excellent are awarded InHomeSafetyGuide CERTIFICATION. 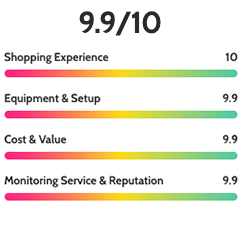 Shopping Experience – Is the company’s representatives knowledgeable and transparent about their costs, service level agreements, and guarantees? Does the price advertised represent the true cost to the consumer? Equipment & Setup – Has the company’s equipment been tested and certified by organizations such as UL? Is the equipment description accurate? Is the equipment setup understandable? Cost & Value – Does the value received match or exceed the cost to the customer? Does the product allow people to continue to live active and independent lives in their own homes? Monitoring Service & Reputation – How fast is a company’s response time? Is it consistent and dependable? Is it there, 24 hours a day, every day, and 365 days a year?